Over the festive season, I found myself at home surrounded by snow….not so terrible as my new sewing machine was delivered and I’ve spent some time improving our soft furnishings. 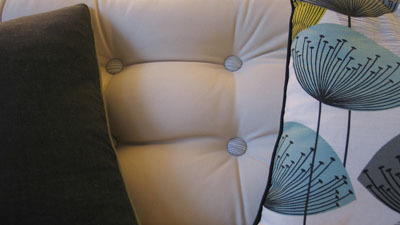 Our sofa is now sporting a bold new tufted cushion look with new throw pillow and matching self-covered buttons. Very stylish (I’d like to think) and what joy to have some home days. This entry was posted in Design and tagged imagination, sewing, winter. Bookmark the permalink.